This recipe is vegan and gluten and dairy free but would make a very nice vegetarian lunch or dinner served with a fried egg and a tomato salad. Place the grated parsnips in a large bowl and season with salt. Using your hands, scrunch the salt into the grated parsnips, giving it a good mix then set aside for about half an hour. This will help remove excess moisture from the parsnips and will give the rosti a better crunch once cooked. Empty the contents of the bowl onto a clean tea towel then bring all of the corners together to the center and squeeze as much water out of the parsnips as you can. You can use a second clean tea towel if you like to help mop up the moisture. When you’re satisfied you have removed as much water as possible, return the grated parsnips to the bowl then add the rest of the ingredients excluding salt and oil. The parsnip rosti mix will already be quite salty but you can add some black pepper. Mix well. Pre heat the oven to 180C. Using a large frying pan, add some oil then bring the pan to a medium/high heat. 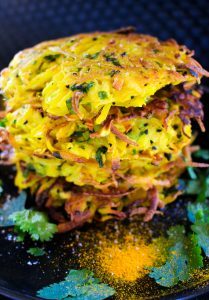 Take a handful of the rosti mixture at a time and using both palms flatten the mixture to form a patty. Add a few patties at a time to the frying pan and fry for about 3 minutes on each side. Transfer to a baking tray then place all of the fried patties in the oven and cook for a further 7 minutes. Remove from the oven, season with a small amount of salt and pepper then serve.